Introducing a proven system for starting a successful freelance writing business, that will help you get up and running in 14 days and earning four figures monthly within a few months of starting. Hello, my name is Bamidele Onibalusi. 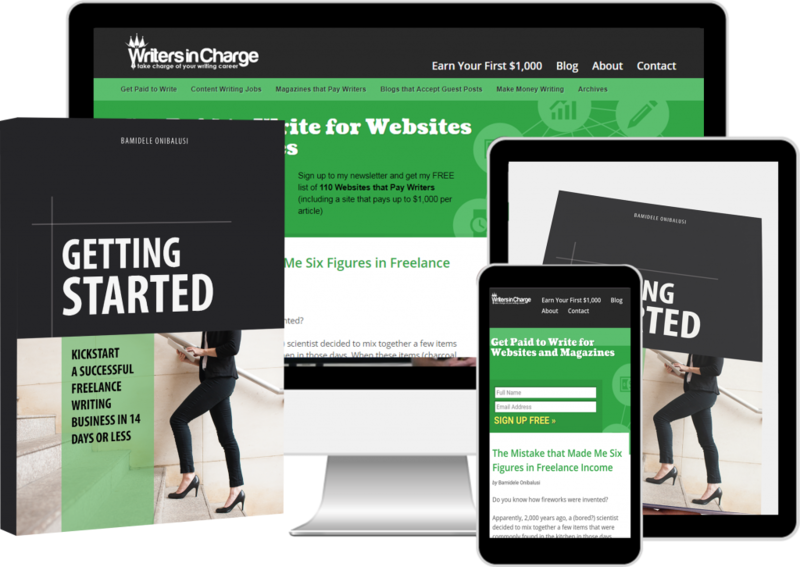 I am the founder and CEO of Writers in Charge, one of the top blogs for freelance writers, as well as a six-figure freelance writer with over seven years of experience. I've been featured on, and recognized by, several leading publications including Business Insider, Forbes, Fast Company and The Huffington Post. 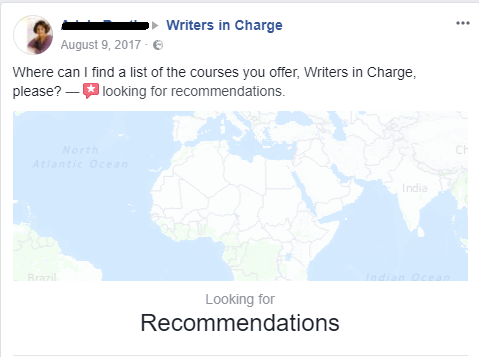 My work on Writers in Charge has been read by millions of people, and over 60,000 people are subscribed to my newsletter. I had just recently heard about the Internet and the concept of “making money online.” To say I was fascinated would be an understatement: so I could sit in front of my computer all day and earn a good living? I mean, no 9 - 5 or working for someone else? I was hooked! I was 16 then and had just failed the most important exam of my life (a national exam I needed to pass to get into university). Things just weren’t working. To say I was devastated will be an understatement. I could make a living without needing to get into university at the end of the day. In my childhood, I had hoped I would never have to work for anybody, but I had no idea that could be a reality so fast -- in my teenage years. The Internet presented such an opportunity. If, just IF, this Internet thing works I could prove to others that I am not a failure. Isn’t the purpose of going to college to get a good job and earn a stable income? If I can make the Internet thing work, well I can kind of shortcut the whole process and prove that I am NOT a failure. Oh, and there’s the “money answereth all things part.” Won’t it be cool to have as much money as I need when I need it? Of course, I won’t pretend that I was paying any bills then (I mean, I was 16 and living with my mom!) but I sure will need money in the future and it wouldn’t hurt to have an early start. Also, don’t think it’s only you adults that have money needs -- young boys have dreams too, and things they want to buy with money (at least I did when I was 16… lol!). So, with all the above reasons on my mind, I couldn’t be more excited about the possibility of earning a living online. I mean, I could earn good income without having to rely on my grades and working a 9 - 5? Sign me up! However, I didn’t realize that I was in my own bubble -- that will soon bust. Maybe you’d have loved to read that everything just went well from there… that I got started, began to earn six figures within a short time and was soon driving lamborghinis. I wish! Except it was the exact opposite of the case! Like many people who have taken a similar trajectory, I FAILED. In fact, I almost failed BIG! I pursued the “make money online” stuff and poured all my heart in it (often working 10+ hour days!) for a whole 1 year and four months without really earning an income. I did so many things: online surveys, paid to click, paid to read, etc. In fact, I was so gullible I would have believed them if I was told I’d be paid to sleep… lol! You get the gist. It wasn’t long before I realized that I was chasing a rabbit trail -- a pipe dream. You see, I had originally been dismissive of freelance writing as a source of income -- as a career path. I mean, in the early days my only impression of freelance writing is that the most you can make as a freelance writer is $3 - $5 (you’d be lucky to earn $15) per article. Boy (girl? ), how wrong was I! I mean, I would have been ecstatic to earn $40 per article at that time, but $100??? Sign me up! 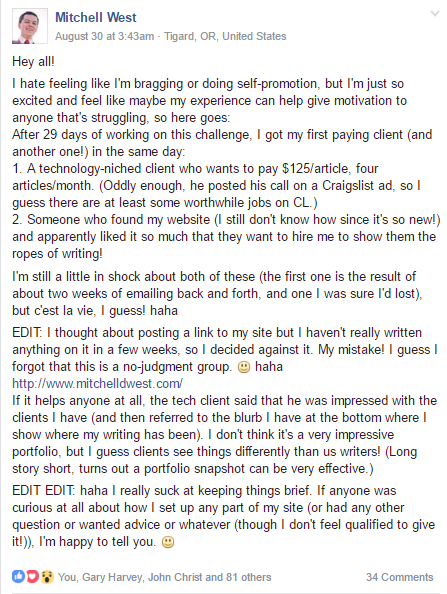 Now, I’d be honest: I had a luckier start than most people, and not everybody will start their freelance writing career earning $100 per article (and in the spirit of full disclosure: after that first client, I later got clients that paid me less than half that amount -- at least before I knew what I was doing), but that was how I got my start. I’d later go on to have my first four figure month with that client a few months after our relationship began. I suddenly realized the potential in freelance writing and began to take a more intentional approach towards building my freelance writing business. You see, a LOT has changed since I got my first client about seven years ago. My freelance writing business has grown so much that I am now a six-figure freelance writer, and I won’t tell you how much I earned in my best month as a freelance writer because you probably won’t believe it (suffice to say it is more than what many “stable” freelance writers earn in a year -- that’s not a typo, I meant in a YEAR!). 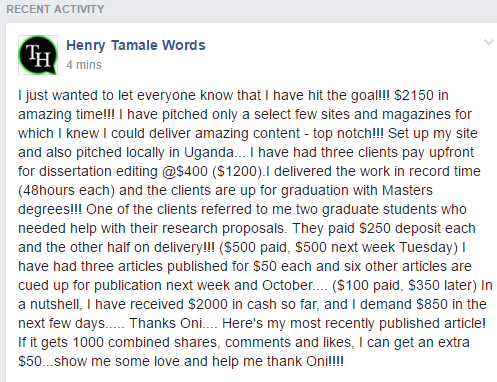 Today, I easily earn in excess of $1,000 per article -- that’s when I want to write. Getting to it, to earn a five figure income from my freelance writing business, I probably need to work less than 40 hours. Let me put it this way: I practically have a license to print money. And I want to give you this same license. With my proven system, you can be assured of a thriving freelance writing business, and an almost divine transformation in your finances. I don’t make excessive promises, and you certainly won’t get paid to sleep (not with my system, anyway!). My promise is simple: I will give you a system, a roadmap, that you can use to have a freelance writing business up and running within 14 days -- even if you have nothing right now. And with this business in place, you’ll be set up to be making four figures in monthly income within a few months of setting up your freelance writing business (for most people, this happens within two months). Okay, so that's it. If I include all the testimonials I have, this page will probably become so heavy that browsers will be crashing. So I'll stop right there! If people could be raving that much -- experiencing the kind of successes above -- from a free challenge, imagine what could happen with an organized, paid course backed by support from me? Unlike many freelance writing gurus, I put my money where my mouth is: I’m probably the only freelance writing expert that has made myself a guinea pig by starting a challenge in which I go from scratch (using a pseudonym, in a different niche and without using any of my contacts or existing resources) to four figures income within a span of two months -- TWICE! With my process, efforts and results documented publicly -- and each time countless people who followed along experienced positive results (the above testimonials came from my most recent challenge). You see, I am so DAMN CONFIDENT about the effectiveness of my system that figuratively eating my own dog food, publicly, doesn’t scare me. I want to give you access to my system TODAY… but for a VERY LIMITED time. You see, Writers in Charge, my popular blog for writers, has been running for more than five years now. And right NOW, you can’t find a single course for sale on it. I have pulled existing ones offline due to my being to busy to support them, and that hasn’t stopped people from begging me to just get them into one of my courses anyhow (even if it is outdated and can’t be supported -- screenshots below) -- this is because the effectiveness of my system has been proven over and over again. For a limited time only, I want to give you an opportunity to get access to my proven freelance writing system: this system will help you get your freelance writing business up and running in less than 14 days, and it will position you to be earning four figures monthly within a few months. You are just getting started and want a PROVEN roadmap to follow to build a successful freelance writing business earning four figures monthly within a few months -- that you can set up in just 14 days. You already have a freelance writing business that is stuck and are confused as to how to make it work. You are still earning $3 - $5 per article and feel that you deserve more. 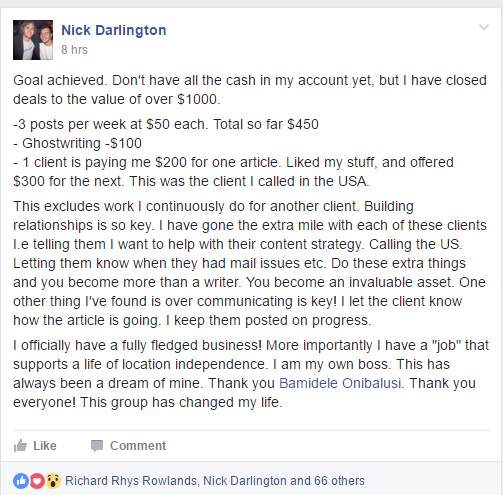 You want a system that can help you get to $50, $100 or MUCH more per article. You are struggling to earn your first four figures and need a proven roadmap to take you there faster. You want a simple, step-by-step system that tells you exactly what to do, gives you assignments, checklists and templates you can do and use to have a successful freelance writing business. If you fall into any of the above category, you should definitely get Getting Started: Kickstart Your Freelance Writing Business in 14 Days or Less. For this particular course, I followed a “no multimedia rule.” By design, this course is delivered via text (a PDF and an email series) so it will only take hours to go through the materials. I am tired of experts loading up “courses” with dozens of useless hours of videos so they could charge you in excess of a thousand bucks to access it. I won’t do that. Your time and mine is more precious than that. I did my best to make this course as actionable as possible; I still made revisions a day before launch, and revisions will constantly be made to make it as actionable as possible -- the end goal is for you to get results. Simple. It requires effort and time. If you don’t want to do the assignments (perhaps you want to get paid to sleep? ), then this course is not for you. The “14 days” time frame promised is the time it takes to setup your freelance writing business and ensure it is up and running -- you certainly won’t earn four figures in that period, but you’ll be positioned to be earning that amount within a few months (possibly within a month or two of starting. The “Getting Started” PDF guide that gives you an overview of my system. An email series with step-by-step instructions aimed at helping you have your freelance writing business setup in 14 days or less. Checklists, resources and templates you can use, edit and modify to kickstart your freelance writing business. 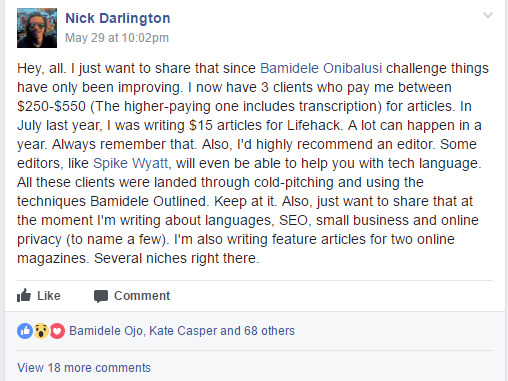 Support from Bamidele Onibalusi (a veteran, six-figure freelance writer) to help you implement the suggestions in the course and get to your first four figures in monthly income. All this for just $99. That said, you have to act fast -- as this offer is only available for 7 days. After 7 days, it will be pulled off the market, and I can’t say when next it will be available -- the last time I pulled off my products off the market, it took over 2 years for them to come back despite people repeatedly begging me for access to them. At the time of reading this, you can be sure that you are closer to the expiration of the 7 days during which the course is available. Simply sign up below to instantly get enrolled into the course. YES, I want in! I want access to “Getting Started: Kickstart Your Freelance Writing Business in 14 Days or Less” right now. If, for whatever reason, you decide within 30 days of ordering this course that it is not for you, you are backed by my 30-day money-back guarantee. Simply send an email requesting a refund and you’ll be promptly refunded. What is "Getting Started" about? Who is the course for? As implied by the name, the course is for those who want to start their freelance writing business on the right foundation. The course is designed with the premise of helping you take the right steps to have your freelance writing business ready and set up in 14 days, so that you will start earning four figures within 2 - 3 months. Don't get me wrong: this course doesn't promise that you will earn four figures in 14 days. I don't believe in, or sell, get rich quick schemes. However, it will help you set up what will be a solid freelance writing business that will be earning four figures monthly within a few months -- all in less than 14 days. How long will the launch be open? 7 days maximum. Possibly less. Is your course suitable to start a writing business in a language other than English? Yes. It is. The techniques are what matters, not the language you are freelance writing in. If there are companies that publish/use content in your language, and if there are freelance writers in your language, the course will work for you. I have no educational or professional experience except that I have always loved writing. Are there any opportunities for me with this lack of credentials? Anybody who tells you that you need educational or professional experience to earn a living as a freelance writer is a joker. If you take a careful look, that person is probably earning peanuts. See, I started earning four figures MONTHLY as a freelance writer at 16 (I'm 24 now!). As a non-native English speaking Nigerian. I hadn't even gotten into college then. So, NO, you DON'T need a degree or credentials to make this work. In fact, if you let your degree get into your head it will probably do you more harm than good. Are there refunds? A guarantee? YES. As with all my products at Writers in Charge, this is backed by a 30 days money back guarantee. My free materials have helped thousands build a successful freelance writing career, so of course I'm willing to put my money where my mouth is when it comes to my paid materials. Are there other payment methods? Other questions? Yes, you can pay with pretty much any cryptocurrency (Bitcoin, Ripple, NEO, Ethereum, etc) listed on a major exchange (Binance, Bittrex, Kucoin, etc). If you are Nigerian, I also accept local bank transfer. 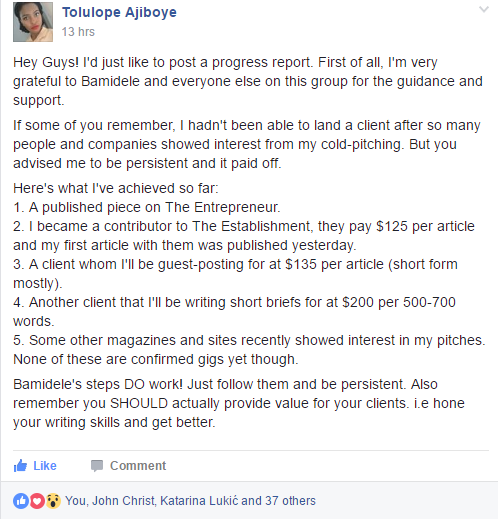 If you want alternative payment methods, or have other questions, email me at bamidele@writersincharge.com.